Genetic Code Shows Bird Flu In China Spread Between People : Shots - Health News Chinese scientists offer the first clear evidence that the H7N9 bird flu virus can be transmitted from human to human. A father, who became sick in March, passed the virus to his daughter. But the risk of transmission is quite low, and the virus still doesn't appear to pose a global threat. 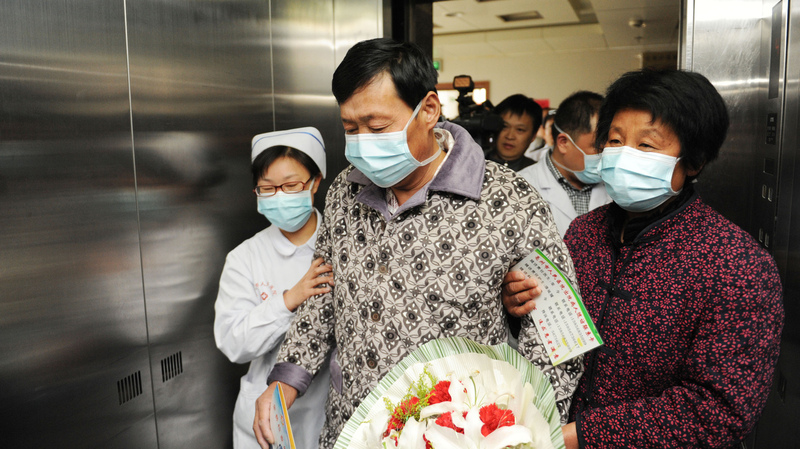 A man who just recovered from the H7N9 bird flu leaves a hospital in Bozhou, China, in April. Since early May, the number of new H7N9 cases has dramatically declined. When a new strain of bird flu cropped up in China last winter, the billion-dollar question was whether the deadly virus could transmit between people. Now, Chinese scientists offer the first clear evidence that the bird flu is indeed contagious, although only slightly. A father, who became sick in March, passed the H7N9 virus to his daughter, epidemiologists report Tuesday in BMJ, the British Medical Journal. But the risk of transmission is still quite low, they say. And at this point, the H7N9 virus still doesn't look like a threat to go global. Since H7N9 first appeared in February, China has recorded 133 cases, and Taiwan one; 43 people have died from the virus. Throughout the outbreak, there have been signs that the virus might spread between people. Most notably, some people in the same families got sick. One of these clusters was a father and daughter who both died of organ failure induced by H7N9. The father, 60, is thought to have caught the virus at a poultry market. But the daughter, 32, hadn't been exposed to birds or poultry before getting ill. She did, however, take care of her father while he was sick and come in close contact with him. So it looked like the woman caught the bug from her dad. To demonstrate that conclusively, scientists at the Jiangsu Provincial Center for Disease Control and Prevention sequenced the genomes of the viruses taken from both patients. The two genetic codes were almost identical, the scientists report, indicating that the bird flu did spread from father to daughter. "Does this imply that H7N9 has come one step closer towards adapting fully to humans?" infectious disease specialists James Rudge and Richard Coker ask in a commentary linked to the study. "Probably not. Crucially, there is still no evidence of sustained transmission among humans." The other 43 people who came in close contact with the father and daughter pair never caught H7N9, Rudge and Coker point out, even though one of them also helped to care for the father. Furthermore, the virus isolated from these patients doesn't look like it has an increased ability to infect people, when compared with other strains. Since early May, the number of new H7N9 cases has abruptly slowed. China has recorded just one case of H7N9 in June and July. But the threat of H7N9 isn't gone, Rudge and Coker write. Researchers expect the virus to return later this year when the weather is right for transmission.